Would you like a peek into Kindergarten? Are you a parent of a Preschooler or Kindergartner looking for school readiness tips? 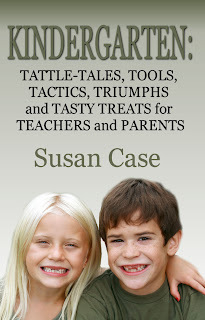 Or are you a kindergarten teacher who needs proven ideas for the classroom? My book has hundreds of ideas to help with behavior, reading, special education, science, celebrations, and recipes for every letter and for success. Discipline--Combat Duty or Common Sense Tactics? ~ unless you are an Amazon Prime Member. Now only $2.99 for Kindle or $12.95 for print copies. Also available on B&N in print, but not for Nook yet. Do you need help teaching your preschooler or even saving your sanity? Just released is Mommy with Selective Memory and my new book with hundreds of ideas and activities for playful learning: The Happy Mommy Handbook: The Ultimate How-to Guide on Keeping Your Toddlers and Preschoolers Busy, Out of Trouble and Motivated to Learn. For more 5 Star Reviews and my blog, click here. Thank you Erin - you have a very interesting blog yourself. The internet is an amazing way to connect and learn. Bet you have some stories to share! Neither book is available for the Nook right now although they will be again in a few months. It is part of the Amazon promotion program that we cannot sell ebooks other places right now. I am sorry. I will send you a copy through email if you would like to do a review on B&N. In fact, I could send you both books for the Nook if you would like. Please email me at susancasetexas@gmail.com if you are interested. Thank you so much. I like your Pinterest board and blog very much. Thank you! I am excited to add this to my reading list! Chrissy - I love your kindergarten blog. I tried to grab your button but it didn't work - probably just me. I will try again later. Thanks so much for visiting. Heather - you are a doll! Thank you so much. Love your blog! Great Heather! Thank you so much for letting me know. I assumed one could read it on the computer. But didn't know about the Cloud Reader. I'll let others know. I appreciate it.